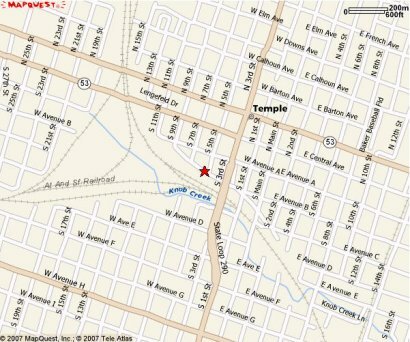 CentraMod is located at 403 W. Avenue B in downtown Temple, Texas next to the old Santa Fe Depot and Amtrak Station in the historic Moody Depot. Be sure and check the Club Calendar for events and club hours. Temple was founded in 1881 and named in honor of Bernard Moore Temple, a civil engineer and former surveyor with the Gulf, Colorado and Santa Fe Railway Company that established the town. For many years it was the home of the Santa Fe Railway Company’s hospital for its employees. It stills serves as a major freight railroad hub to this day. Both the Union Pacific Railroad and BNSF Railway have mainlines serving the city, and a BNSF rail yard and locomotive maintenance facility are located here. These facilities are directly across from the depot’s old loading dock and the BNSF mainline. Amtrak also serves the city with its Texas Eagle passenger train. Every Saturday at club meetings you can see the Texas Eagle take on passengers around noon. 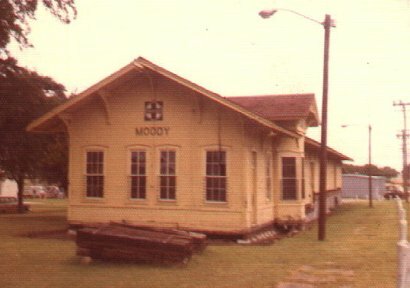 Moody was established in 1881, when the Gulf, Colorado and Santa Fe Railway laid track. Fuel, water and crew stops were built along its route. The Gulf, Colorado, and Santa Fe built this classic long frame depot for Moody, Texas in 1908. This photo was taken by Joyce Woods Cox. For more information on the history of Moody, Texas, visit their website at www.moodytexas.com. 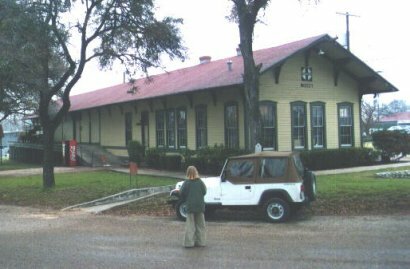 The City of Temple moved the depot from its original location in Moody, Texas to house and inaugurate the Railroad and Pioneer Museum in 1979. R.J. McKay took this photograph of the depot in 1973 not long after its move to Temple. Originally chartered in 1973, this museum (now called the Railroad and Heritage Museum) was founded as an educational, non-profit organization to encourage public participation in preserving local history and culture. Its collection consists of approximately 75,000 artifacts, mainly railroad and pioneer items ranging from 1880 to the 1950s. This photograph on the last day of 1998 was taken by Hume Kading and catches the street side of the depot. The bay window is located on the opposite side. You can find more information on ATSF depots in Texas at the web page maintained by Evan Werkema, Santa Fe Surviving Depots: Texas. The depot was then moved a second time to its current location on August 23, 2001 next to the restored Temple Santa Fe Station. The club has occupied the depot and served as caretaker since June 2002.